In North Texas, we’re all about convenience. The drive-through Starbucks, burger joint, even drive-through bank. Still, there aren’t any drive-through health clinics. But there are clinics on wheels — they’re run by Parkland Health & Hospital System. The clinics have been crisscrossing Dallas for more than a decade, serving the people in the community who need it most. 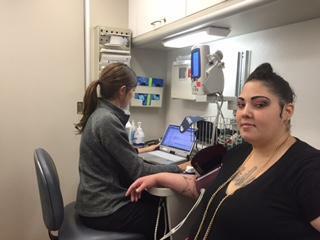 Patient Hannah Salam gets checked on the mobile health van by nurse Cori Dickie. 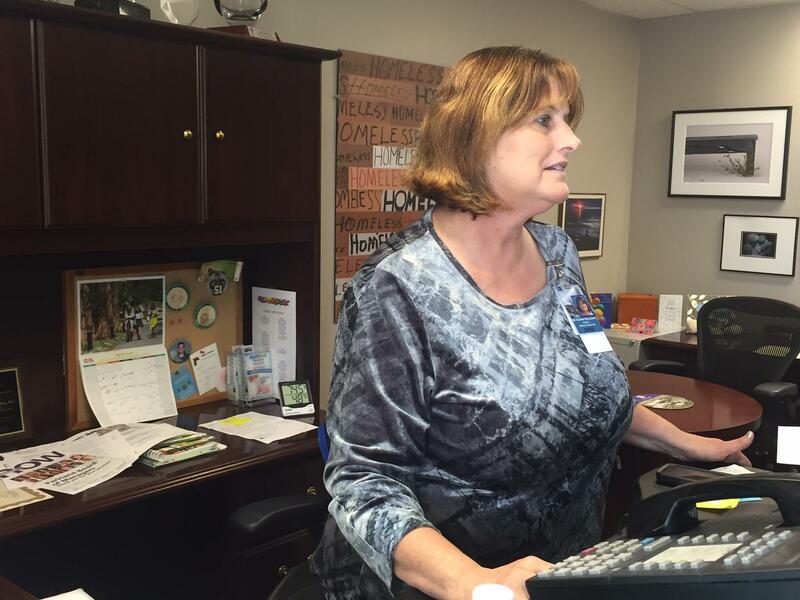 “When I first came in, I was kind of surprised it was really set up like a medical facility,” she says. Salam got out of prison a few months ago and is staying at a halfway house before she’s off parole. She’s on this van to get the results of a lab test she took a week a week ago on another of Parkland’s mobile vans. This kind of follow up sounds mundane, but it’s fundamental to treating people on the move. In the back of the van, past a bathroom and some noisy generators, is the physician assistant’s office. Shakira Johnson has been working on this bus for three years. It’s hard to say how many people are homeless – lots go in and out of housing or shelters. The latest homeless count for Dallas and Collin counties by the Metro Dallas Homeless Alliance’s annual report shows the homeless population has increased more than 20 percent since 2015 — from 3,141 to 3,810 people. Dr. Susan Spalding, medical director of the Parkland Homeless Outreach Medical Services Program, says these folks face the same health problems as everyone else — high blood pressure, diabetes and asthma. But they have issues with transportation, health insurance and with getting prescriptions. Dr. Susan Spalding is medical director of the Parkland HOMES Program. The mobile vans make it as easy as possible to get help, and they’ve been a success. In 2015, more than 9,000 homeless Dallas residents — including 1,655 kids — have been aboard for care. “There are lot of mobile clinics right now, many more than people might imagine,” says Caterina Hill, principal investigator of “Public Health Quality and Mobile Clinics” at Harvard Medical School. “We’ve estimated that an average visit to a mobile clinic costs the funder $155 but saves 12 times that in terms of long-term benefits and avoided emergency department visits,” she says. Even with Parkland’s mobile health clinics, Spalding says there are still homeless people struggling to get health care. So, you can count on these clinics continuing to rack up mileage as they roll around Dallas County.